One of the most common reasons I hear for not eating healthier is that it is expensive. We debunked this myth in my post titled “How to Eat Seasonally“. But, many people also argue that although the seasonal produce may be cheaper, the fruits and vegetables go bad before you can eat them. Here are some ways to extend the life of your fruits and vegetables, reduce food waste, and ultimately save you MONEY! Most people will think this is simple advice. But, a lot of people still do not plan out their meals each week! I cannot overstate the importance of writing down and planning meals ahead of time. This is HUGE in reducing food waste. Devoting about 30 minutes each week planning your meals is usually enough to have a solid schedule. Devise a grocery list as you plan each meal. Need more helping planning healthy meals? 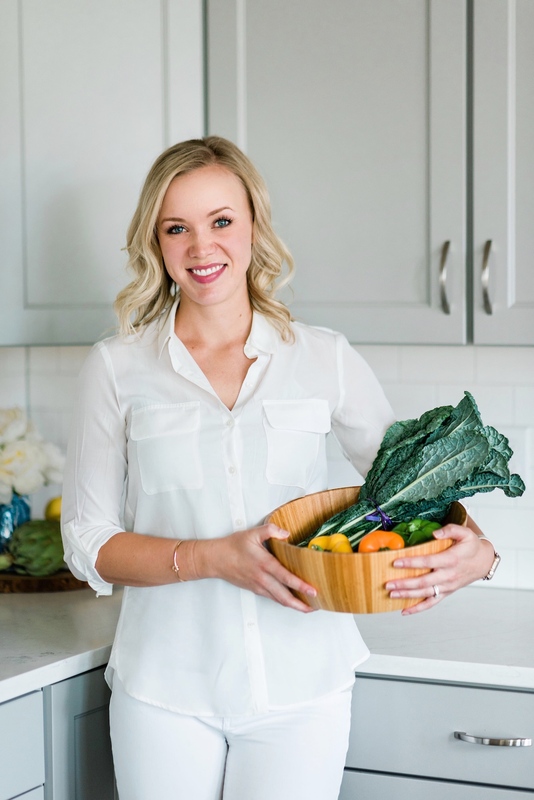 Download my free meal planning blueprint to guide you! I also use Pinterest A LOT to help with my own meal planning. Follow my Pinterest board to find more meal ideas (breakfast and snacks, too!). A plan is worthless if you don’t stick to it! Keep your weekly meal schedule in a place where you will see it often: the front of the fridge, your weekly planner, your outlook calendar, reminders in your phone etc. Take 5 minutes the night before to quickly scan your meals for tomorrow. Does anything need to be thawed in the fridge? Do you need to take out the crockpot for tomorrow’s meal? Does anything need to be chopped or packaged for lunch? Leftovers is another simple, yet completely underutilized tip to reduce food waste. Plan your dinners accordingly, so you can have leftovers for lunch the next day. Add more bulk to your meals by amping up the vegetables! You can also use plant-based proteins, like beans or lentils, to provide bulk to your meal. PRO TIP: package your lunch leftovers BEFORE you get your own serving for that meal. This helps to control dinner portions, and gives you a definite lunch for the next day! Understand expiration dates to reduce food waste. 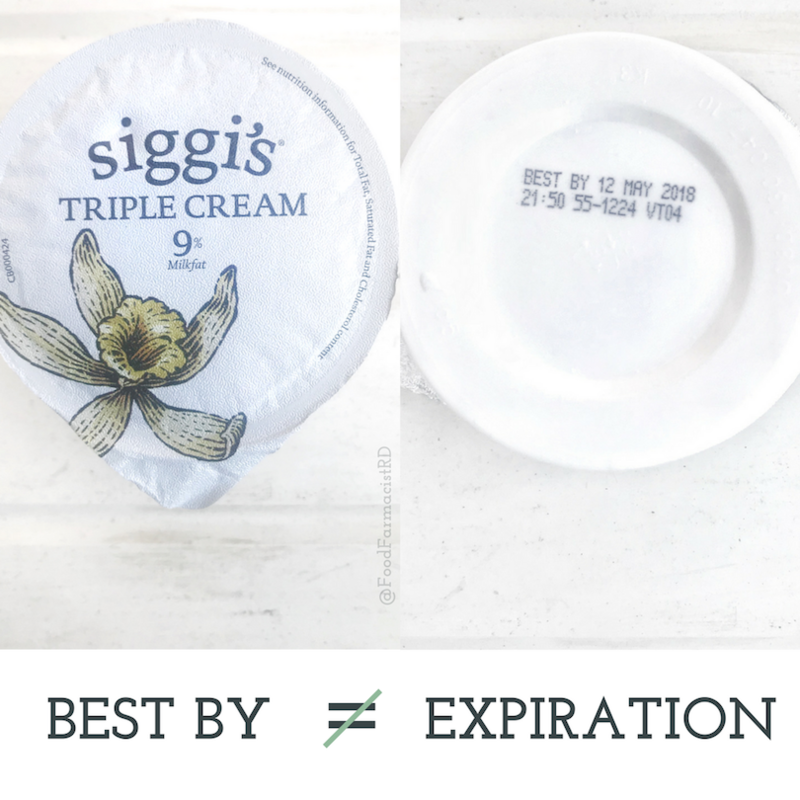 “Sell by” or “Best by” dates are NOT expiration dates. Food manufacturers provide these dates to imply when the food item reaches peak quality. It does not necessarily mean that the food is not safe to eat. As always, use your best judgment and senses to determine if a food is still safe to eat. But, don’t feel like you must discard the food just because it is past it’s “sell by” date. Note: Expiration dates are still valid, throw out any food past their expiration date. Stock up on frozen vegetables. Plan 1-2 meals per week (or more if desired) using frozen vegetables. Vegetables are the second most wasted food in America. Frozen vegetables are flash frozen at their peak ripeness and have almost identical nutrient properties as fresh vegetables. This makes them a key player to reduce food waste! If your plans change and you don’t eat at home, there is no food waste– frozen vegetables can stay good for a long time…up to 10 months past their “sell by” date in the freezer! It is also good to keep frozen vegetables on hand for any last-minute meals. Remember to choose frozen vegetables that do not have a “sauce” or “seasoning” included, as these are often high in trans-fats and additives. Season the veggies yourself after cooking. My favorite way to flavor vegetables are with butter, lemon juice, sea salt, pepper, and garlic! The most common way to cook frozen vegetables is by steaming. This can be done in the microwave or over the stove-top. Incorrect storage of produce can cause increased food waste. Remember this rule of thumb: “rot-low, wilt-high”. 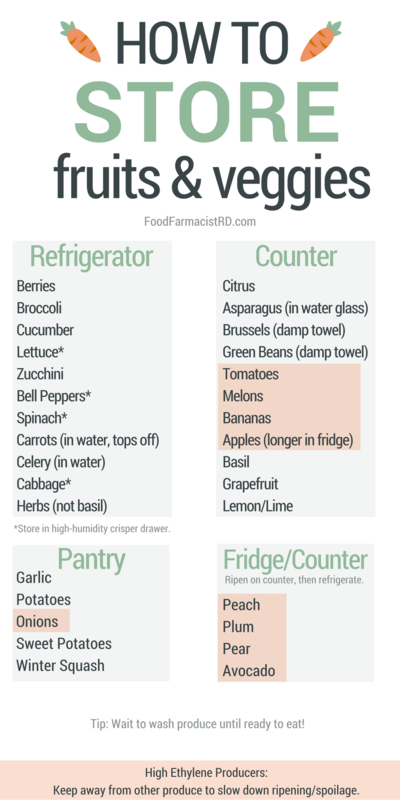 AKA most vegetables are more prone to wilting, so keep most of these in the high-humidity crisper drawer. Most fruits are prone to rotting, so make sure these are kept in the low-humidity crisper drawer. Some fruits should not be kept around other produce because they emit ethylene gas. This gas causes other produce to spoil sooner! Refer to the chart below to make sure you are correctly storing each food item to extend its shelf life. The Colorado Proud logo indicates locally grown, raised, and processed food products. Plus, eating local food supports your home economy! Your money spent with local farmers stays close to home and is reinvested in local businesses and services. Reduce food waste with storage hacks. I just bought a set of these FreshWorks Food Containers from Rubbermaid, so I can’t speak to them (yet), but they have over 1500 4+ star reviews on Amazon! These look great for storing chopped lettuce/greens, and berries. According to the description, the bottom of the food container elevates produce away from moisture and promotes airflow to help prevent spoilage. I have one of these tomato savers at home. Tomatoes should always be kept on the counter or in the pantry. But, I plop a tomato in the refrigerator 1-2 days before I use it on a cold product (like salads or tacos). Once you cut into a tomato, it should stay in the fridge. I use this air-tight container to store my cut tomato for later use! Tomatoes produce ethylene gas, so they should be kept away from other produce. This fruit basket is awesome, because the top part comes off, if you have bananas that you’d like to hang on top instead. The fruits that should be stored on the counter, like apples, oranges, bananas, and lemons go in these baskets. Since most of these are ethylene producers, you keep them away from other non-ethylene producers to prevent food spoilage. Plus, research shows that keeping fruits readily available on the counter results in greater likelihood of eating them! For the freshest tasting produce, you need to shop for this at least weekly. You don’t have to do a huge grocery haul every week, though. Purchase some of your foods in bulk, so you always have these items on hand. That way, the only thing you are buying each week at the store is fresh produce, meat/seafood, and various odd end products. Here is a list of foods I recommend buying in bulk (for example, at Costco). 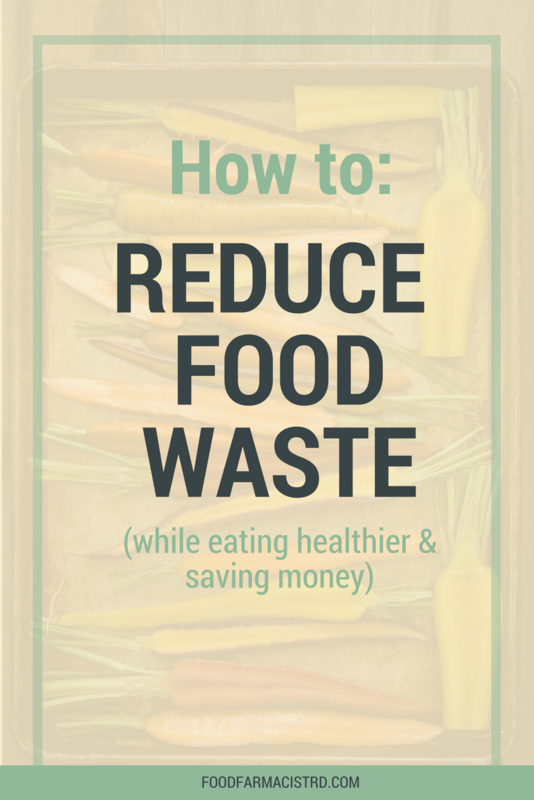 By reducing food waste, we can eat healthier while saving money in the process. Reducing food waste also helps our planet, and is a more sustainable practice along with supporting local farmers!